Last week was HackWeek at Square, and as usual I took the opportunity to stretch my maker legs. This time I decided to tackle a practical problem that’s on my horizon – or perhaps more accurately, in my peripheral vision. My current workstation has two Apple Thunderbolt Displays. This is, as you might imagine, awesome. There’s tons of desktop real estate to lay out browsers and code and terminals. However, this setup does have a dark side: it’s 50″ wide! Not only does this require me to pan my head to see the far edges of the most distant windows, but it’s actually wider than the desk space allotted to me. As soon as someone moves into the vacant spot next to me, one of these bad boys will have to go. VESA mount already attached so I could experiment. 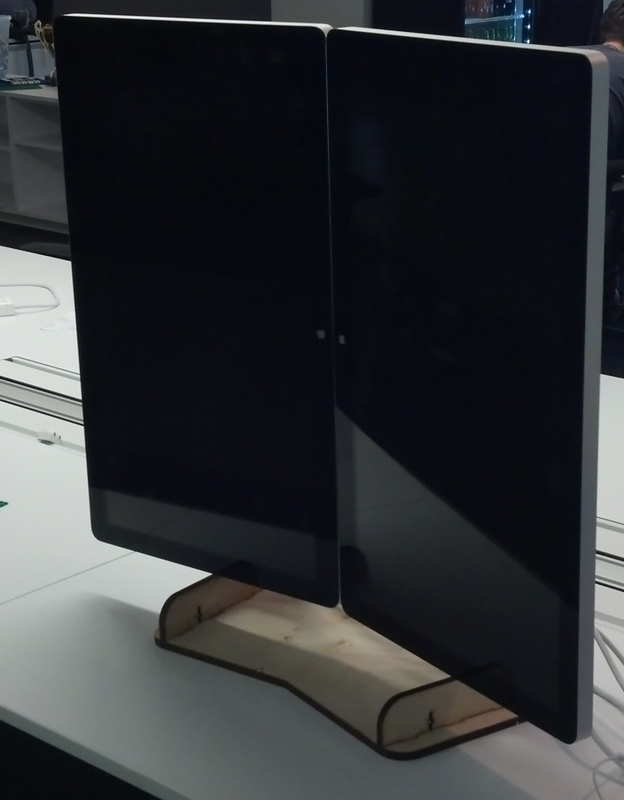 Once your monitors are ready to be mounted, you need a stand. There are commercially available stands of all sorts, but that’s no fun, so instead I designed a custom stand using my favorite tool of choice, OpenSCAD. I wanted something that would be cheap to fabricate and easy to assemble that would still turn out handsome and sturdy. 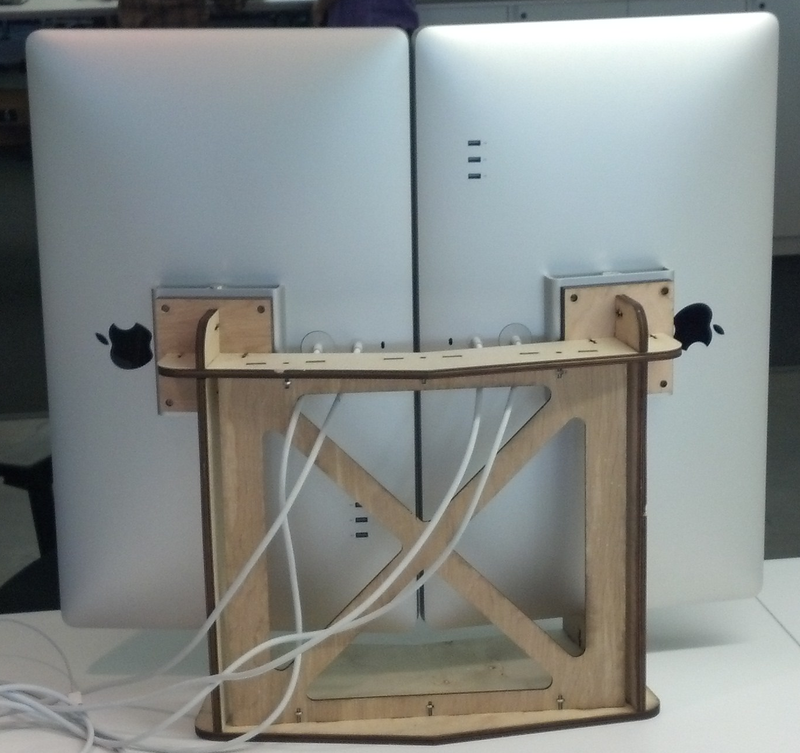 This led me to choose laser-cut birch plywood and the standard T-slot style screw-together construction. This version seems to work pretty well, though I’m still planning to to a nice sanding, staining, and clear-coating pass to make it extra presentable. I also set my personal best for time from conception to realized prototype – I started sketching on Tuesday afternoon and had the stand built by noon on Friday. As usual, all the project files are available on my GitHub page. If you’re thinking of making one, let me know! This entry was posted in Uncategorized on June 16, 2013 by bryanduxbury. One part or another will ultimately break down, so it has to be modular and easily repaired, particularly by someone other than me. It should be incredibly intuitive to use. After all, it’s not even clear that the people using it will speak English! The interface is very simple. The strip of LEDs down the right hand side indicate the state of the programmer. The top one is just power, so you know it’s on. The next is the “contact” indicator, which lights up when a target board is properly connected. After that is “working”, for when the programmer is programming, and then “success” and “failure”. I etched the descriptions next to the LEDs, but used different colors so that it’s clear even if you don’t read the text. You start the programmer by pressing the only button on the faceplate, marked “Go”. The exterior of the device is laser-cut 3/16″ acrylic. We just happened to have clear laying around, but I think that a more opaque color might work out better. I used standard T-slot style construction to put it together, with the exception that I used long screws from the top to the bottom to make a sort of sandwich. All the fasteners are #4-40, which I’ve found to be a great size for these small-scale enclosures. On the inside, the components are simple by design. The brain of the whole operation is just a plain old Arduino Uno. I chose to use an Arduino as the driver for the programmer for a few reasons: I’ve used the ArduinoISP sketch a lot in the past very successfully; there was already existing code to convert an Arduino into a standalone programmer; the USB port and barrel jack were the only connectors I needed; and Arduinos are completely ubiquitous and easily replaced. In addition to the Arduino, there are a few custom components. First, there’s a shield I designed that mates with the Arduino and provides all the connection adapters to the two other peripherals. 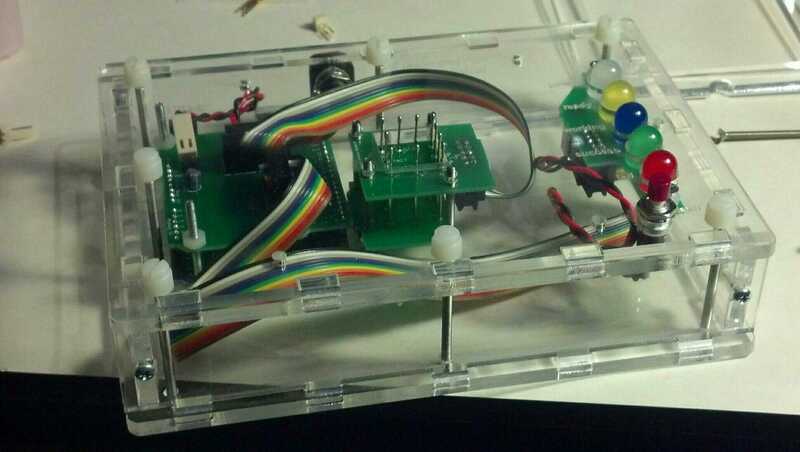 It also has a handful of resistors for lighting the LEDs and a capacitor to suppress the auto-reset that occurs when a computer connects to the USB port – a must-have when operating as an ArduinoISP. Next is the interface board, which is basically just an LED array and the Go button – not much to see there. The most interesting and challenging to fabricate component is the pogo pin array. I took inspiration on how to make this thing from a number of other pogo pin projects I’ve seen across the web. I made a point of breaking this out into a separate module so that I could isolate “fragile” electronics like the Arduino from any sort of mechanical stress. I found that setting the pin height was a little fidgety, and I’m going to experiment with alternative techniques for that the next time around. I based my programmer code very heavily on the existing AdaLoader project. However, there were a number of tricky issues I had to chase down to get it to work in my application. The original version was designed for flashing bootloaders onto ATMega168 chips, and there are some assumptions baked in to match that choice of target. Since I am flashing ATTiny44 chips instead, I needed to figure out the mismatches and update accordingly. The first step was spending some time with the ATTiny24/44/84 datasheet to get some information like the chip signature. Next, I had to capture the hex file of my compiled code. The Arduino UI creates this file already, but it puts it in a random location every time. Finding it is pretty easy if you turn on the debug logging feature. (Basically, just set upload.verbose=true in your preferences.txt file.) After that, the path to the hex file is displayed in the window at the bottom every time you build/verify. With the hex file in hand, I ran into my first real issue. For some reason, even though my program was actually laid out in contiguous memory, the hex dump produced by the Arduino IDE broke it up a bit towards the end. The AdaLoader code didn’t like this – it expected every hunk of data in the hex dump to be full and got confused when it wasn’t. I ended up writing a short Ruby script to transform the hex file into a clean, contiguous dump. I couldn’t quite figure out what I was doing wrong when trying to calculate the line-ending checksums, but I wasn’t really worried about data integrity between my laptop and the Arduino, so I ended up disabling that feature. At this point I ran into my second issue – really, a pair of issues. What I was seeing is that the flashing would complete, but when the programmer read the bytes back to verify them, it failed, saying that the values were wrong. Uh oh. This was a real head scratcher for a while, so I spent some more time reading the datasheet. The first issue I found was that while the ATMega168 has a 128-byte flash page size, the ATTiny44’s was only 64. That was concerning, so I changed the settings, but the problem persisted. After reading the code very carefully for a while, I managed to debug it to point where it looked like it was flashing two different chunks of data to the same memory address. In fact, there was an odd pattern of alternating correct addresses and incorrect addresses aligned on 128-byte boundaries. (0x0 -> 0x0, 0x40 -> 0x0, 0x80 -> 0x80, 0xC0 -> 0x80…) This turned out to be because the target address was being masked with a pattern that aligned on 128-byte boundaries – clearly a relic of the code’s prior purpose. I just removed the mask altogether and all of the sudden everything started working! What I have now is a device that can be powered by a simple wall wart and will program an un-flashed board in about 5 seconds, much faster than if we were doing it with the computer attached. Woo hoo! There are a few next steps for this project before I’m considering it done. The programming part of the device is important, but so is the testing part. I’d like to figure out how to make the programmer put each newly-programmed board through it’s paces briefly so that we can identify defective boards early, before they are glued inside finished lamps. Also, there are a handful of places where the part tolerances of the laser-cut parts aren’t perfect, and making another copy gives me the opportunity to correct those mistakes. The version that I end up sending to China should be a bit more polished and feature-packed. This entry was posted in Uncategorized on June 4, 2013 by bryanduxbury. At Square, candidates are expected to actually write code during the interview process – on a computer, not on a whiteboard. As a competent software developer, this kind of interview should feel like a gift. Your skills are going to be measured more or less directly by doing the very thing you’ve been doing all these years! So how do you impress me – or any interviewer – in a coding interview? Here are a few things I consider when pairing with a candidate. First off, let’s deal with a myth: the interview is not about the answer to my question. Sure, I’d prefer that you get it right, but I’m far more interested in seeing how you work to get there. I want to see how you decompose problems, conceive solutions, and debug issues as they arise. Make sure you take the time to show me how you’re getting to the answer. A big part of the development process on a healthy team is communication. Ideally I’d like to leave the interview feeling like you’re someone who asks good questions and is receptive to feedback and external insights. A great way to blow this portion of the interview is to hunch over a notepad and scribble quietly while I wait. If you must do something like this, be prepared to explain your thoughts thoroughly when you’re done. My interview exercise is hard. I fully expect that you might need a hint at some point. I even enjoy working with you to debug the problems you hit as you work. But if you never ask, you’re not going to come out ahead. Coding on a real team often involves working on something that you don’t understand, but that the person sitting two seats down knows in detail. You should be self-sufficient only insofar as it makes you productive; spinning your wheels trying to go it alone is just indulgence. Don’t make me march you through all the steps. Once I’ve explained the exercise and you’ve started coding, it’s best if you drive. If you need help, ask. If you think you’re done, propose more test cases or ask for my thoughts. The best interviews I’ve had are more like working with the candidate than interviewing them. If you can do this in an interview setting, then I can believe you’ll work the same way when you’re on my team. I am consistently impressed when a candidate is able to drop into a debugger or quickly access documentation in the IDE of their choice. It’s an aspect of professional mastery that will be extremely important to your day to day productivity. The inverse is also true – if you choose to write C++ in vim and don’t know how to save the file, it’s going to cost you. One of the key attributes I select for in coworkers is pragmatism. Sometimes this means choosing an ugly but expedient solution instead of an elegant but expensive alternative. If you know when to make these tradeoffs, you’re someone I want to work with. A lot of candidates feel pressure to give me “perfect” solutions right away, but I’d rather see an answer than an incomplete, perfect one. Plus, I love it when we can iterate on the “quick and dirty” solution to build a refined version. This is how software works in the real world, and I love when candidates aren’t too self-aware to just go about it casually. This entry was posted in Uncategorized on April 7, 2013 by bryanduxbury. In a turn that few will have seen coming, this coming Friday will be my last day at Rapleaf. After five years, I’ve decided that it’s time to move on and seek new challenges. To that end, after much consideration, I will be joining Square to help them scale up their analytics efforts. I’m incredibly excited to get to work with a new team on a totally new problem domain, and I believe I have a ton of value to add to the company. This decision is exquisitely bittersweet, though. It’s difficult to even begin to describe how spectacular my time at Rapleaf has been. I found it telling that when I tried to sit down and write a summary of my experience for my resume, it seemed impossible to summarize all that I had learned and done. This is still totally insufficient, but I’ll boil it down to this: I was given the opportunity to make many amazing software systems; I was allowed to grow into a member of the broader engineering and open source community; I learned the meaning of scale; I got to be a real owner of the business’s direction and purpose; and I played a role in building a world-class team. It is this last point in particular, the team, that puts the tears in my eyes. I have never before had the opportunity to work with so many brilliant, hard-working, interesting, and just generally nice people, and I am humbled and honored to have been counted among their number. My greatest worry – one which I consider not wholly irrational – is that the team I’m leaving behind is in fact of the rarest kind, and I’ll spend the rest of my career hoping to rebuild something as great. To everyone I have worked with over these last five years, thank you for everything you have taught me. You are what has – and will continue to – make Rapleaf great. Let’s do this again some time. This entry was posted in Uncategorized on June 24, 2012 by bryanduxbury.